A 40 yo male with RTA, brought unconscious. On admission CT brain show mild diffuse cerebral edema. MRI done to rule out Diffuse Axonal Injury. Dw images show abnormal restricted diffusion in the region of fornix, corpus callosum with punctate low signal intensities on T2*GRE. Similar punctate restricted diffusion seen in the region of posterior limb of left internal capsule suggestive of an Axonal shearing injury. Unlike other post traumatic brain lesions like contusions which occurs due to direct impact on brain parenchyma and deformation of the brain, DAI is the result of shearing / rotational forces that occur when the head is rapidly accelerated or decelerated, occurs commonly in auto accidents. There is acutual disruption of axons due to shearing injury, which refers to damage inflicted as tissue slides over other tissue, parts of differing densities and distances from the axis of rotation slide over one another, stretching axons that traverse junctions between these areas of different density, especially at junctions between grey and white matter. Commonly affects white matter in areas of cerebral lobes, deep grey nuclei, brain stem and the corpus callosum. The finding is often associated with poor Glass Glow coma score. 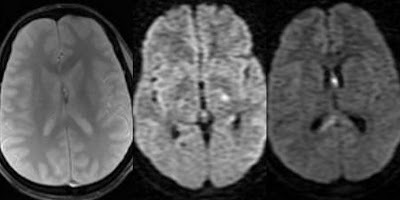 Lesions in DAI can be hemorrhagic and non-hemorrhagic? It's right? The hemorrhagi will show low signal on T2*GRE and the non-hemorrhagic will swow restricted diffusion...Right? My question is: the same lesion can have low signal on t2*GRE and restricted diffusion? Or the hemorrhagic lesion will create Magnetic susceptibility artifact in diffusion sequence? In others words, ADCmap will not swow low signal? It would be Shine Through?